Hello gang. Today we have a special treat for you—a Guest Post from the amazing and lovely Katie Stephenson, of Art Wall fame. If you are familiar with Art Wall, then you already know how awesome it is. 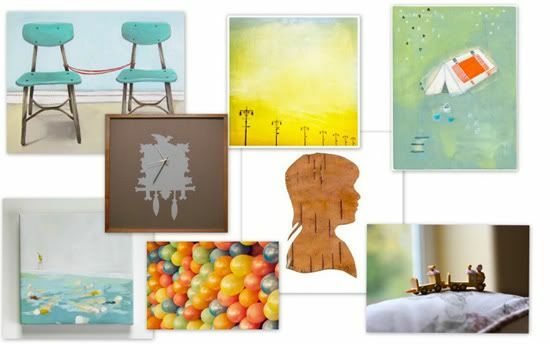 Katie has a fantastic eye and curates a fabulous collection of art in a wide variety of styles. Last week I posted about Wolfie’s bedroom and many of you seemed intrigued by the mix of vintage and original art we had hanging in there. Decorating a child’s room doesn’t have to be limited to teddy bears—so I thought it would be fun to get some tips from a pro like Katie. We are so thrilled she agreed! Take it away Katie! Hi there! It’s Katie Stephenson here and I’m honored and excited to be guest-posting today at Modern Kiddo. If you don’t know me, I run the Art Wall website and blog, I’m also a mom to one, pug-owner to one, and wife to, well—to one. I love what Alix and Dottie are doing on M.K. and I’m happy to be here. 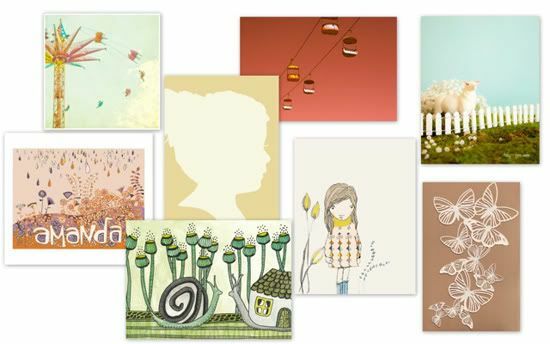 The theme for today’s post is: choosing and arranging art for a child’s room. The best advice I have is to pick things that are appropriate for the child, but also work for you. If mom and dad like it, and it fits, it won’t seem too juvenile and will grow along with the child. 1) Mix fun child-themed objects and tchotchkies, such as vintage flash cards, typography or signage numbers or letters. 2) Include some type of inspirational phrase or “words to live by” advice for your child. 3) Items like a clock, a plate or even an embroidery hoop will add interesting shapes and/or texture. 4) Add in artwork that reference the parents or family—such as a line from dad’s favorite song, a favorite spot, a musical instrument, car or even a pet. 5) Another little trick is using two pieces from the same artist in an assortment. It will help bring cohesion to the group. 6) One last touch is picking a mix of original and print pieces. At least one original piece will add richness to the grouping. My little secret for planning arrangements comes from using editing software on the computer. You can do this with a program such as Illustrator or Photoshop, but if you’re like me and like things super easy, it’s just as effective to try in Picnik or Picasa. 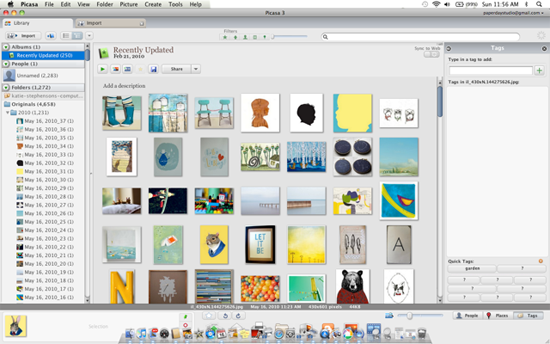 I like Picasa best for its arrangement ability. 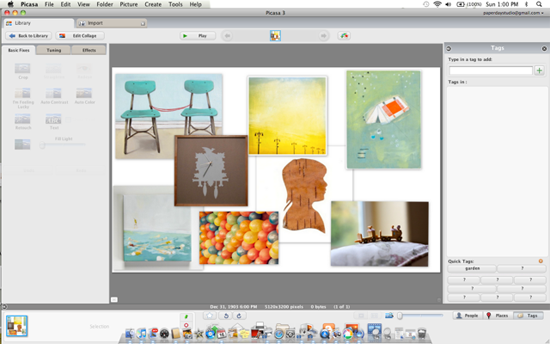 Start by loading images of all your favorite pieces—select ones that work together in your eyes to form a “collage.” You can even re-size them so that they reference their real size in comparison to the other pieces. Add/delete and move the pieces around until your eyes are happy. So now the question is, which one is your favorite? Thank you so much Katie! Personally, I’m loving Art Wall #2, but I’m kinda obsessed with that awesome Dandy Squirrel by Ryan Berkeley. And don’t feel daunted if you don’t know how to use Picasa. Take a look at Katie’s tips and simply try and incorporate one or two of them! Hanging an unexpected piece (frame an old children’s record cover, hang a shadow box with fun “objects” inside or buy “letters” from the craft store and spell out a words like “laugh” or “mommy is always right” etc.) can add so much visual interest to a room. Have you done anything unexpected with your kiddo’s room? Send it our way! We love to showcase nursery and room tours! Also, please be sure to stop by Art Wall to browse more lovely pieces—and don’t forget, Katie also has a fabulous blog that I just know you’ll all enjoy. VIVA ZE ART! amazing. I still don’t think I would be able to figure it out though… a small learning curve here. haha. I will certainly give it a good try. 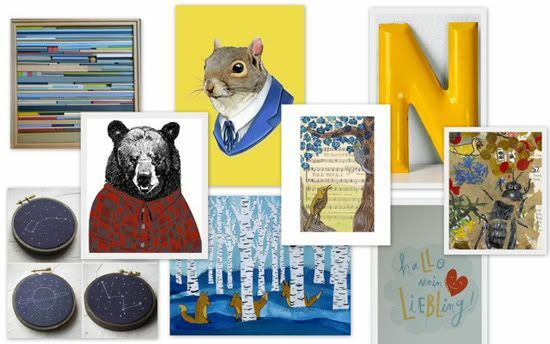 perfect timing….i am just collecting together all the art for pip’s walls! so i can finally finish her room! I love this post! I’m going to send it along to the RocketMan, who does all the art arranging in our home–he’ll be pleased to see he’s already integrated many of your tips! This is such a great post–not only because it is helpful for the nursery, but also great for the rest of the house. Today, art is just so affordable and can make such a great difference to any room. Hurrah Art Wall Katie! Thanks for the fun comments, gang. Rocket girl, you’re right. I think I may have been a bit mad at the pug when I wrote that because he just mad me shell out $500 for his dr’s visits and teeth-cleaning. He’s all forgiven now-Ha. 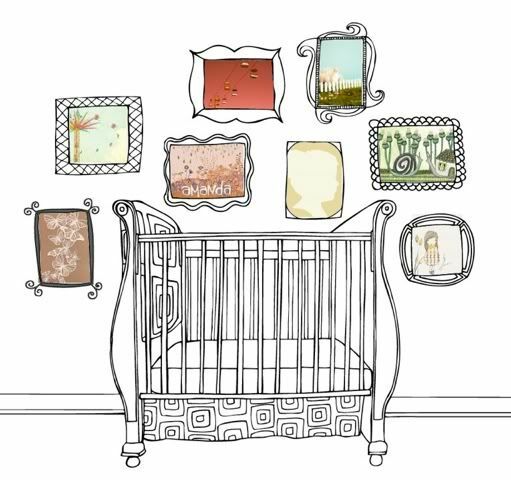 I love Art Wall, and we’re so excited to have one of our pieces currently hanging in the nursery. And Alix, I’m with you. I LOVE Ryan Berkely’s work, especially that squirrel. I just saw him at Crafty Wonderland and am still kicking myself that I didn’t buy it that day. I’m in the planning stages of decorating my son and daughters shared bedroom. Lots of great ideas here. Thanks heaps. and also the rest of the website is very good.